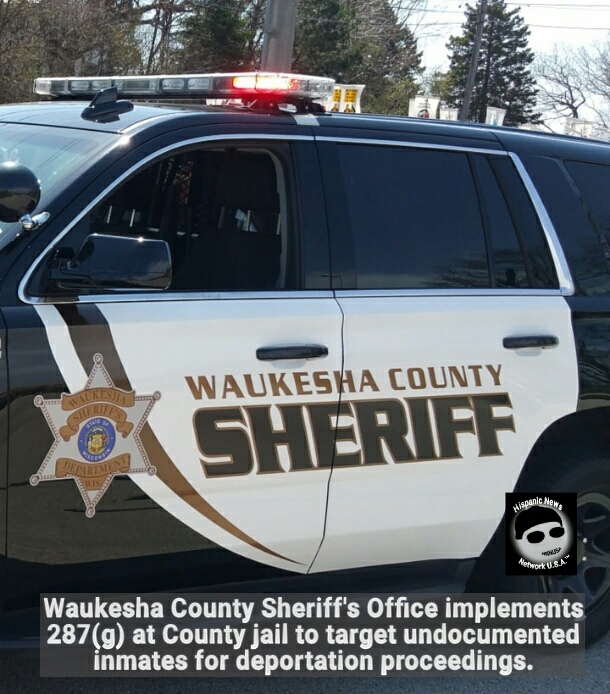 The Waukesha County Sheriff’s Office to implement 287(g) ICE program targeted at suspected undocumented immigrants processed for minor traffic violations at the County jail. Waukesha, WI – On Friday, several Waukesha County Sheriff Correction Officers completed their 287(g) certification ICE program and the County jail will begin to process inmates for legal status in the country that have been arrested for minor traffic and other violations. Those undocumented immigrants that have been processed for booking at the jail will be turned over to the U.S. Immigration and Customs Enforcement (ICE) for deportation proceedings. Eric J. Severson, the Waukesha County Sheriff confirmed to Hispanic News Network U.S.A. (HNNUSA) that multiple correction’s staff members from the jail facility had been designated to take the U.S. Immigration and Customs Enforcement (ICE) 287(g) training and certification from June 18, 2018 to July 13, 2018 and upon completion, the 287(g) ICE program will be implemented at the jail facility in late July or early August. Severson in the application for 287(g) indicated that all ICE detainer requests to hold suspected undocumented immigrants processed at the jail for traffic violations and other crimes will be honored. According to Sheriff Severson, most undocumented immigrants at the County jail have been processed for the following violations. According to the Waukesha County Sheriff’s Department 287(g) program ICE application, the Waukesha County jail takes into custody more than 11 additional immigrants each month. With the implementation of 287(g), the County jail is expected to increase the processing of undocumented immigrants for deportation.